For game developer Matt Thorson, tough-as-nails yet kind-as-kittens platformer Celeste represented a breaking point. His depression and anxiety had gotten so severe that he had no choice but to face them head-on. Thorson says the process was “painful,” but it’s also when Celeste’s story began to take shape. Warning: this post contains spoilers for Celeste. For Thorson, it made perfect sense to explore these ideas in a platformer. In the process of recognizing that he’d been pushed to the brink by a wall of anxiety, he also came to realize that, as a child, challenging SNES platformers were his escape from it. “As I made that connection, it just made sense that the game was about that,” he said. 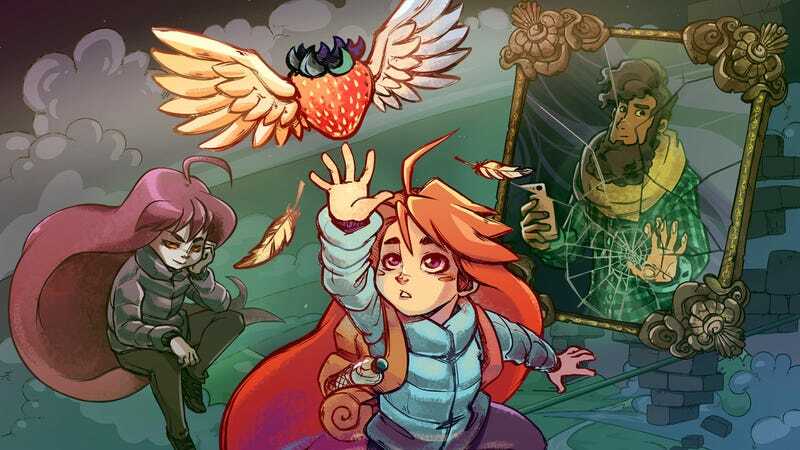 Even once the game’s basic premise—main character Madeline grappling with a physically manifested other side of herself that represents her own depression and anxiety—was nailed down, Thorson still had no idea where exactly Celeste would end up. He was, after all, still in a knock-down, drag-out battle with his own other side. “I didn’t know how it would end because I was still dealing with this stuff while we were making it,” he said. Celeste, then, became a game about taking care of yourself, and understanding that, sometimes, you have to make yourself a priority in order to avoid hurting others. The game illustrates this especially well through Madeline’s interactions with Mr Oshiro, a ghostly hotel owner who can’t bear to let go of a crumbling ruin that represents his former life. Instead, he lives in an eternal state of denial. Madeline wants to help, so she follows Mr Oshiro through a hotel that’s entirely abandoned save for his own baggage. She does this at the expense of her own goals and well-being, and after a while, it all becomes too much for her. At the worst possible moment, she decides to ghost on her newfound ghost friend, transforming him into a fearsome manifestation of his own anxiety in the process. While the level, much like the rest of Celeste, is pretty on the nose, it smartly conveys what it’s like to contend with mental illness while also trying to be a helpful, sociable person. It’s a crucial part of the coping process that arguably more elaborate games about mental illness like Hellblade have missed. Thorson, though, said that unlike Hellblade, his team never consulted mental health professionals, preferring instead to tell a story that arose from their personal experiences. The key, for Thorson, was recognizing that he had to accept what was going on in his own head. While Celeste begins with Madeline single-mindedly determined to conquer a mountain in place of her own troubles, she comes to find that she’s looking at it all wrong. Instead of beating the other side of herself into submission, she learns to function alongside it. But even the game’s ending is, for Madeline, just part of an ongoing process. Thorson’s favorite response to the game’s story comes from Reddit. One player reached the part of the game where Madeline begins to reconcile with herself, only to find themselves feeling “left behind” by Madeline’s acceptance of her other side. They felt an intense connection to Madeline moments before, when she was berating herself and “beating” her inner demons into submission, but the game lost them after that. They made a lengthy post about it and ended by saying they weren’t sure if they could keep playing the game. As for Thorson, he’s still contending with his own anxiety and depression, something that’s become much more manageable now that he’s not knee-deep in the sanity-testing process of making a video game.